These are addictive. And they are wheat-free. Which makes them dangerous. If you are looking for really fast and yummy cookies, these definitely fit the bill. The picture below shows 1 of 3 cookies sheets that this recipe made. 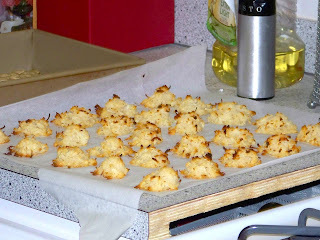 Mix together the sweetened condensed milk, salt and vanilla, then fold in the coconut. Whip the egg whites to soft peaks and then fold the coconut mixture gently through the beaten egg whites. Drop the dough by rounded teaspoonfuls onto a baking sheet lined with parchment paper or a silicone liner. These WILL stick to a regular greased baking sheet. Bake at 325 degrees F until golden brown, about 15 minutes. Cool completely on the baking sheet before removing the cookies. Notes: You really need to watch these when they cook. The coconut on the edges will burn if you leave them in too long.